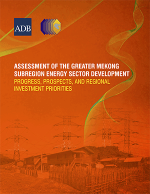 The primary objective is to update information on regional energy resources and to analyze the prospects for regional energy sector development, taking into account the progress of projects under the GMS Vientiane Plan of Action, 2008-2012, and the various national energy projects, especially those with important regional implications. The new Greater Mekong Subregion (GMS) Strategic Framework, 2012-2022 calls for increased focus from conventional infrastructure to multi-sector investments, and greater emphasis on infrastructure "software" to build on physical connectivity and increased coordination across sectors. The GMS countries requested Asian Development Bank (ADB) assistance in preparing a multi-sector regional investment framework (RIF) to foster economic corridor development and in proposing an investment program aligned to the new framework. As an input to the development of the RIF, this report analyzes the GMS' current energy situation and the challenges and opportunities it faces, given its resource endowments and development efforts. Over the past 2 decades, there has been remarkable progress in the GMS energy sector at a national level. Yet in regional cooperation, infrastructure "software" and market liberalization, progress has been uneven. The creation of a Regional Power Coordination Center is a critical step forward, but should be matched by supportive infrastructure, national electricity market reform, and workable rules for cross-country trade. The report endorses the 500 kilovolt backbone grid for the Lao People's Democratic Republic, interconnecting Thailand and Viet Nam, to form the nucleus of the regional market. The report proposes support for the Subregional Energy Forum to drive regional policy creation through stronger capacity for policy analysis.